The Lando's Millennium Falcon Expansion Pack contains a fully-assembled, pre-painted customized YT-1300 light freighter miniature, including a detachable Escape Craft miniature that can be piloted as a separate ship. 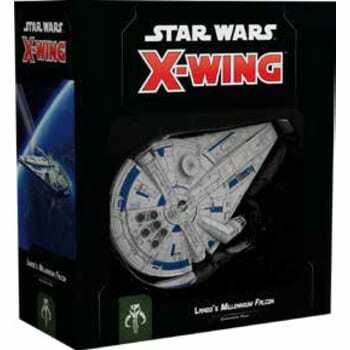 In addition to these miniatures, you'll find eight ship cards featuring classic characters like Han Solo alongside new faces like the droid revolutionary L3-37, as well as thirteen upgrade cards to further customize your version of the Falcon or your other second edition ships. Rounding out the pack are all the tokens, bases, and maneuver dials you need to add the Falcon and its Escape Craft to your squadron.